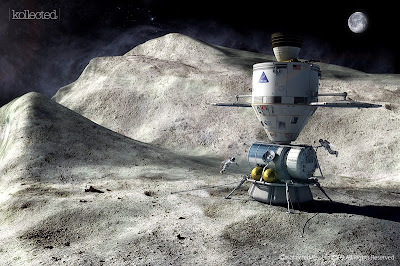 Without using or investing in the overhead of lunar hardware three entrepreneurs in twin Dragon Puffs connected by a Bigalow hab/radiation-shelter will spend a month drinking beer, eating cold pizza, and watching YouTube while floating to a Near Earth Asteroid. Upon arrival, since they are not unimaginative NASA bureaucrats, risk-adverse academics, or scientifically illiterate politicians they will toss the protocol for collecting regolith samples to the solar wind. Instead they will spend a week stuffing every nook and crevice of their craft with regolith, sorted or not, while inflating massive canisters filled with a slurry of volatiles and PGMs set to drift slowly on their own way to L1. They will transfer their beer and buddies from the Dragon with a cushion base which had landed on the asteroid to the Dragon and Hab which had been hanging out in orbit a slight distance away. Following that, once the beer is safely ensconced, they will use duct-tape, velcro, and a few spare shoelaces to patch up whatever wear-and-tear the Dragon lander may have experienced. Then, just before heading for home, they will initiate the What-the-Heck-Let’s-Give-It-A-Shot-Before-We-Sober-Up procedure: remotely tilt the unmanned Dragon lander with a cushion base on its side, and, as if it were an undersea craft slowly floating across a reef, drift it horizontally to one of the many massive multistory mountain sized boulders strewn across the asteroid surface. 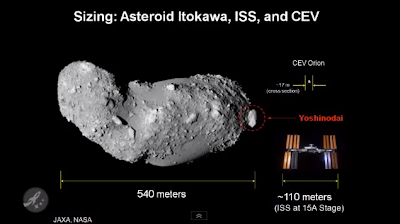 After carefully resting its landing cushion perpendicular to the boulder they will gradually apply more pressure until velocities increase from centimeters per hour to kilometers per hour and so on, gently pushing a mountain of PGMs and volatiles to L1. –Without fancy recycling systems, without special equipment, and certainly without anything associated with the moon. Our 3 half-witted heroes will have accomplished 2 things, with or without NASA. They will always be able to buy beer and — apart from fantasy future He3 — no one will ever mention lunar resources again. With vast resources at L1 we will finally concentrate on Mars settlement. 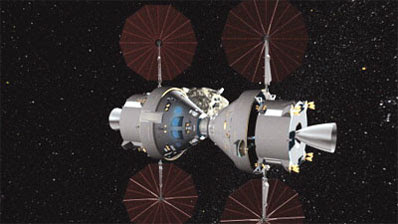 Dedicated Earth-based simulation of exact Martian thermal, atmospheric, and solar conditions will provide more realistic evaluation of Martian architectures than extremely expensive, unnecessarily dangerous “Martian/ISRU practice” on the moon; future construction and refueling of GEO satellites/interplanetary craft will be much more easily accomplished at L1 than on the moon. (1) Transit to an asteroid will take between only two weeks to at most two months. (2) An asteroid studded with enormous surface boulders can be sufficiently assayed robotically prior to the two week period astronauts would work at the asteroid. (3) Costs are extremely low without lunar overhead, landers, etc; Delta V fuel requirements are minimal since there is no landing or relaunch (the entire operation takes place in Zero G). (4) Extensive separation of asteroid material can take place on the boulder at L1 and LEO, leisurely, long after the retrieval mission. (5) Once even a single PGM asteroid fragment with volatiles is at L1 discussion of Lunar resources becomes absurd. With massive NEA resources at L1 Moon First advocates will return to arguing for a moon base “for the sake of a moon base.” It will have no value other than to hinder our progress further into the solar system. If you don’t like Mars, drop it — that does not need to be part of the equation. Just work with a massive amount of profitable PGM/volatiles at L1 — between the Earth and the moon — and pet projects involving lunar rovers, lunar greenhouses, lunar overhead of all kinds will be seen as irrelevant. Mars seems to be a convenient distraction, a strawman, an excuse lunar scientists use to not discuss Near Earth Asteroids. The cool thing about this debate though is that it doesn’t matter what we decide, since, for-profit mechanisms will create a L1 NEA resource depot before anyone returns to the moon — by the sheer force of informed capital. Once massive amounts of precious metals and volatiles are already at L1 it becomes ridiculous to speak of transporting “asteroid debris” in the lunar regolith to L1, or, constructing equipment or fuel depots on the moon. It is much, much easier in terms of equipment overhead and fuel to coast out to NEAs than to land and launch from the lunar surface — especially for any serious amount of resources. 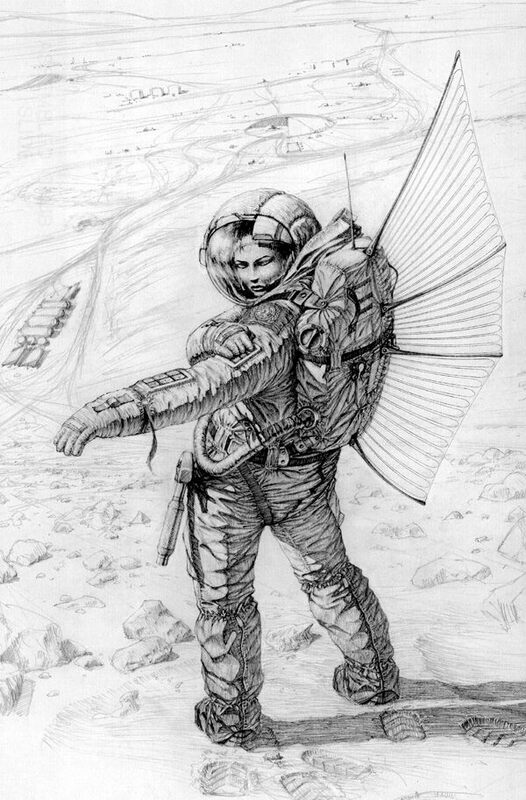 In the August ’09 issue of Ad Astra, Denis Wingo — who has earned admiration as a tireless advocate of entrepreneurial space exploration — writes of a future landing expedition finding on the surface of the moon a large PGM boulder remaining from an asteroid impact. The purpose of the above Dragon Puff story is to point out that if a similar — albeit even much larger boulder — were found on the surface of an asteroid (they are studded with such structures) it would be much easier to transport the boulder to and use it at L1 than to engage resources for similar purposes on the moon. –Especially given that this could be done by entrepreneurs without either lunar overhead or heavy lift or even NASA approval. If a massive PGM rock is sitting at L1 then lunar resources become irrelevant to ANYTHING we do in space, anywhere — even, ironically, ON THE MOON. We would actually mine the piece of the asteroid at L1 for resources to be used on the moon. LOL : ) Now THAT is funny! Eventually we will construct many of the heavier components of robotic telescope constellations at L1…future far side L2 radio telescopes in zero G will be constructed and repaired at L1. The moon will not have an extensive permanent human presence until Mars has been definitively settled, if then. The moon is a Siren’s Call. This entry was posted in Asteroids, Digital Art, Fiction Writing, Mission Plans, Oh Yeah Baby, Vehicles on September 30, 2009 by FriendlyHelper. The Mars Foundation: "To Arrive, Survive, and Thrive"
Near-term, reliant upon only contemporary technology and human ingenuity, engineers, planetary scientists, and architects work together through the Mars Foundation to create blueprints for our species to permanently settle and thrive on another planet, now. Plans extend from first footfall to dirt covered surface habs to mountain side settlements. 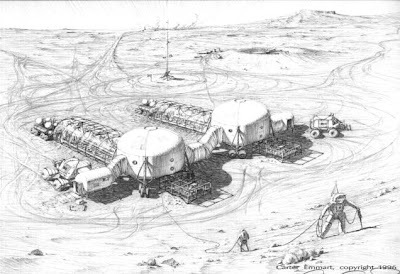 The ultimate goal of the project is to design, fund, and build a thriving, growing, permanent settlement on Mars. 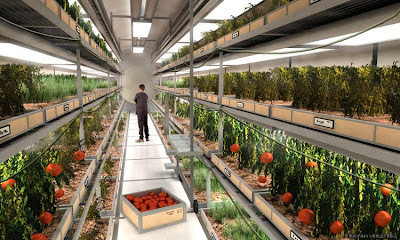 The initial goal for the Mars Homestead Project is to identify the core technologies needed for an economical, growing Mars Base built primarily with local materials. Efforts will then be focused on prototype projects of increasing sophistication. These include the selection of existing off-the-shelf equipment which could be used on Mars and the construction of prototypes of new technologies. 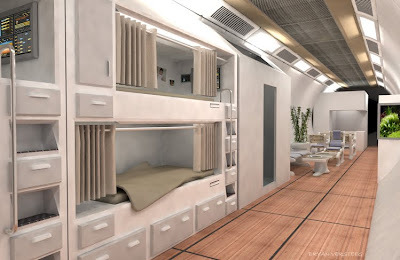 Below and above are images of interiors of the tubular surface living quarters and greenhouses expected to be used during the first decade of settlement. 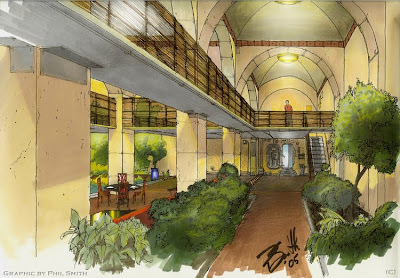 The image below, by Phil Smith, depicts a large, open, multi-story masonry structure located deep within hillsides. Natural sunlight is directed into this area from lightpipes above. A Mars settler leans on the bamboo rail and takes in the view, which includes lush greenery and wide open spaces. Areas of expertise include: Materials, Structures, Mechanical Systems, Architecture, Agriculture, Nutrition, Process/PSSS, Electrical Systems, I&C, Data/Telecom, EHS, IE, Mars Geology/Topography, Space Transportation, Spacesuits, Systems Integration, and many others. Some locally derived materials have been examined for initial settlement construction. These materials include locally produced fiberglass – wound on site, metals, masonry – either for un-pressurized shelter or covered with regolith to hold the pressure, polyethylene & other polymers made from ethylene from the CO2 atmosphere, and any plant products – especially if a byproduct of food growth. The MHP team continues to evaluate these options as well as a number of potential alternatives. This entry was posted in Architecture, Digital Art, Mission Plans, Sets, Settlements on September 29, 2009 by FriendlyHelper. In honor of the Mars Phoenix, now silent in the Martian winter. The frigid wind whipped the icy sand against her helmet as she rounded the small rock outcropping. She staggered for a moment before regaining her balance and pushed forward. Her communicator crackled. She activated the transmitter, and responded. The signal crackled, and faded. She assumed Williams had signed off, and pressed forward. A glint sparkled momentarily through the dust. She squinted, and adjusted the polarization of her visor. The Martian landscape was still bare here near the poles: no-one had yet found it profitable to construct a dome this far north. Her communicator crackled again. She could now see a small structure half buried in dust and ice. The distant sun glinted sharply off several of its surfaces. Though her suit was fully heated, she felt a chill go down her spine. A long silence settled in, and she pushed her way the last few feet. Reaching out a hand, she brushed a bit of dust from the surface, and felt an electric thrill as her gloved fingers came in contact with the ancient artifact. With a click, she silenced the communicator. She would deal with Base in a minute. She caressed the metal, and smiled. This entry was posted in Fiction Writing on September 15, 2009 by FriendlyHelper. 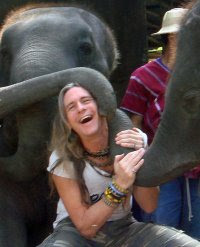 Carter Emmart is human, check out his Facebook profile picture. Looks like a fun guy climbing out on his monkey tree. Most of us don’t bother to climb, content to spend our lives waiting for permission even to live. 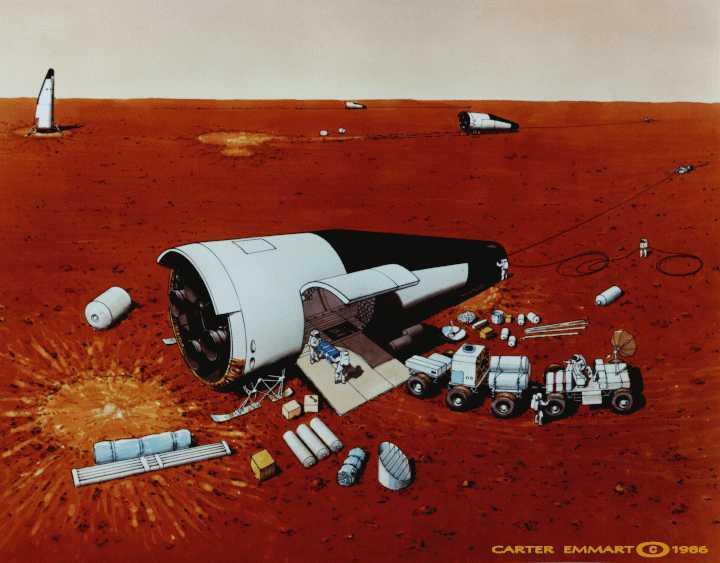 As a space advocate with his own understanding of ‘professional,’ Dr. Emmart has become a legendary figure in the space advocacy community: no one has been more influential in promoting humans to Mars through art than Carter Emmart. An original founder of the Mars Underground while at the University of Colorado, Carter Emmart has been Director of Astrovisualization at NYC’s Hayden Planetarium since the late 1990s. He has collaborated with visualization teams from the National Center for Supercomputing Applications and the San Diego Supercomputer Center. The American Natural History Museum’s full dome space shows are now playing in world wide distribution. Emmart, who previously worked at NASA Ames Research Center and the National Center for Atmospheric Research, received his BA in geophysics from the University of Colorado where he was an organizer of the Case for Mars Conference series. Realistic. Near-term. Human. If you are interested in Mars you have almost certainly seen his definitive, archetypical drawings. Created before CG — black and white, in pencil — they still inspire like no others. Their informed, educational, scientifically literate themes set a standard in Mars Art to which all Mars Artists in any medium aspire. 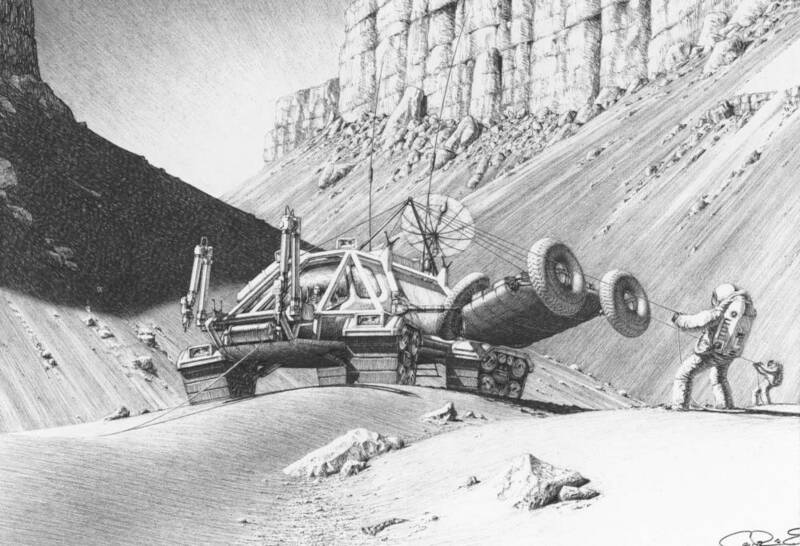 The above artwork is from the book, “Strategies for Mars: A Guide to Human Exploration”, a textbook on the issues associated with the human settlement of Mars. 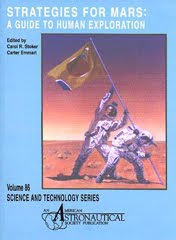 Edited by Carol Stoker (NASA Ames Research Center) and Carter Emmart (then at the National Center for Atmospheric Reseach), this ground-breaking text draws together twenty-six individually authored chapters by noted authorities in fields considered crucial for understanding human settlement of Mars. 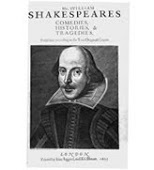 This book was originally suggested as an idea by the former Thomas O. Paine, NASA administrator from 1968-1970, and Chairman of the National Commission on Space, 1986. 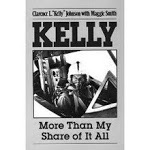 He died in 1992, leaving as his last work, a chapter for this book. 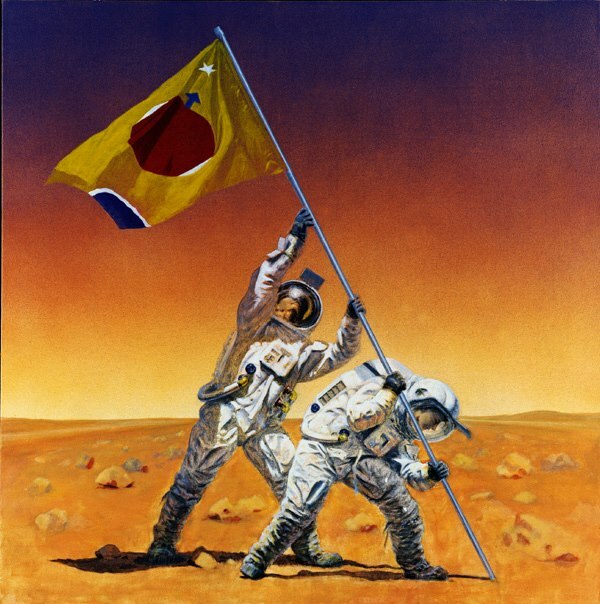 His design for the Mars flag is shown on the cover being raised by his grandson. Directed by Carter Emmart, Journey to the Stars is an engrossing, immersive theater experience created by the American Natural History Museum’s astrophysicists, scientific visualization, and media production experts with the cooperation of the National Aeronautics and Space Administration (NASA) and more than 40 leading scientists from the United States and abroad. Featuring extraordinary images from telescopes on the ground and in space and stunning, never-before-seen visualizations of physics-based simulations, the dazzling new Journey to the Stars launches visitors through space and time to experience the life and death of the stars in our night sky, including our own nurturing Sun. Tour familiar stellar formations, explore new celestial mysteries, and discover the fascinating, unfolding story that connects us all to the stars. Those who come along for the journey may never see the night sky in the same way again. A hundred years from now Martians living in a thriving vibrant human community will ask what motivated Mars settlement. Who wrote the pictures with a thousand words? Carter Emmart. This entry was posted in Carter Emmart, Digital Art, Illustration, Sets, Settlements on September 7, 2009 by FriendlyHelper. From Frisco to Fermi, from Seoul to CERN, Hollywood to Bollywood…with JAXA, ESA, and every major NASA institution, contractor, and subcontractor thrown in..SpaceX included..Mars Artsists is off to a running start. 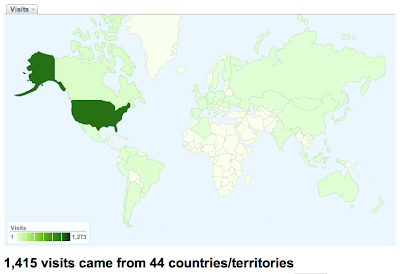 Not too shabby thanks to you! This entry was posted in Propaganda on September 7, 2009 by FriendlyHelper.